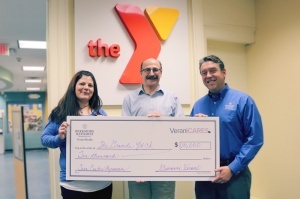 Berkshire Hathaway Verani Realty recently contributed $10,000.00 to the Granite YMCA in Manchester, NH. The donation will be used to help extend the size of the YMCA's Teen Center. Currently over 60 children utilize the Teen Center on a daily basis. The space is about 2200 sq. ft. and they are hoping to expand the center to over 6000 sq. ft. They will be building two new teen centers in the next twenty-four months, to be located in both Manchester, NH and Goffstown, NH. Giovanni Verani, President of Berkshire Hathaway HomeServices Verani spoke with Hal Jordan, President/CEO of The Granite YMCA and Natalie Barney, Teen Center Director, of the Granite YMCA's Downtown Manchester location to discuss the programs they offer and the integral part the Granite YMCA plays in the development of local children. Some of the teens that Giovanni talked to explained how the YMCA provides them with structure and a responsibility in becoming better citizens. They shared how the programs they participate in help them excel in school and they feel while at the YMCA, they are given the additional support they need to improve confidence and performance. The Granite YMCA was selected as one of the top three YMCA's for their character development program, where they advocate Respect, Honesty, Responsibility, and Caring as their core values. After meeting with this particular group of teens, it's clear to see that these are values that they learned to embrace. The kids in the community need a safe place to go with positive role models, which reduces the likelihood of them picking up negative habits that could become destructive later in life. Some of the teens we spoke with shared that they were getting into trouble prior to attending the Granite YMCA and since they have been there, they have a more positive outlook, have made lasting friendships, and feel part of something bigger. The Granite YMCA offers homework assistance, arts and crafts, sports programs, culinary programs, and more. The Granite YMCA follows the local school calendar, offers transportation from the middle schools and, is completely free. We're proud to support the development of their new Teen Center.